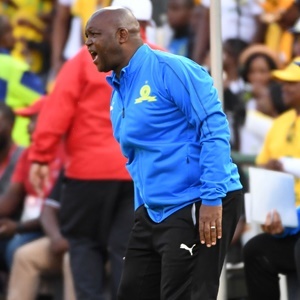 Cape Town - Mamelodi Sundowns head coach Pitso Mosimane said his table-topping side were aiming for a win over Orlando Pirates after being held to a goalless draw at the Orlando Stadium on Monday. Mosimane though in a post-match interview felt his side gave as good as they got and were unlucky not to gain all three points over their title rivals. "Look we wanted to win," Mosimane said. "To be honest we always win here, I'm not bragging but we always win here. "Tonight was very difficult, Pirates are a good team and they played very well so we can take a point from this game it's okay." Mosimane then went on to heap praise on the travelling support at a sold-out arena as the defending Absa Premiership champions take aim at defending their crown. "Brilliant, you can hear? Who is singing?... Masandawana here at Orlando Stadium and really it's humbling when people love you, you really feel it in your system but I have to give them something back though, they deserve a title."